Canadian company Island Tug and Barge (ITB) of Vancouver, BC, upgraded its 136 foot tug, the Island Monarch, with an Intercon articulated pin system. As part of the retrofit, two Nautican high- efficiency Triple Rudders were installed to enable the low-3000 horsepower pusher tug to turn. Island Tug is the largest supplier of oil cargo transport in Western Canada and has a long history of serving coastal communities up and down the west coast. It is the largest supplier of bulk fuel products to Vancouver Island, and is British Columbia’s only domestic supplier of underwater cable laying services. With this upgrade, conducted at Allied Shipbuilders in Vancouver, the offshore tug Island Monarch became the company’s first articulated pin tug. The refit matched the Island Monarch with the Island Trader, a 368 foot, 65,000-barrel fuel barge, creating an articulated tug/barge (ATB) unit. 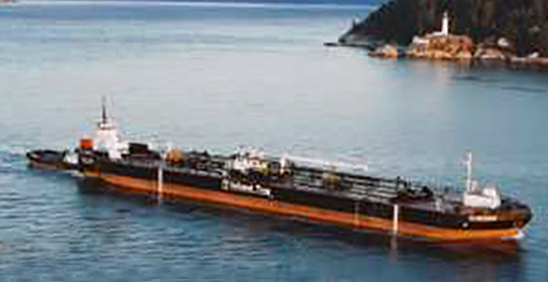 In one of her first voyages after the installation of the rudders, the Island Monarch was sent to retrieve the Island Trader from China and push the barge across the Pacific to Vancouver, BC. In the process, the Island Trader/Island Monarch became the first Intercon ATB to cross the Pacific Ocean. Bob Shields, President of ITB, reported that the skippers all agreed the new triple rudders improved the tug’s maneuverability. As an example, Shields recounted that on the trip down the Wangpu River, where the boat traffic density was high and the river had sharp bends, the pilot never had to order more than 10 degrees of rudder. The triple rudders were also extremely useful in keeping the ATB on course during the ocean crossing. Nautican developed its high performance, high-aspect ratio Triple Rudders to improve the maneuverability of vessels using nozzles for propulsion. The rudder system is intended for towing, pushing, ship berthing and other demanding applications. Nautican Triple Rudders do not interfere with propeller flow, while giving the vessel better maneuverability. By using a differential linkage and unique geometry, the entire propeller outflow can be directed up to 60 degrees to the side without the loss of thrust or engine overloading. This deflection makes it possible for even large vessels and barge trains, like the Island Monarch/Island Trader ATB, to make tight turns. In trials, rudder side force is measured to be 74 percent of the bollard pull. Nautican Triple Rudders are easily adapted to replace single rudders. Due to the short chord length, Nautican Triple Rudders require lower steering torque than the equivalent single rudder. The rudders are delivered with all three blades and all pintle bearings assembled and aligned. In the case of the Island Monarch, the vessel’s existing spade rudder was cut off, leaving the rudder stock, which was then linked to the Nautican system.